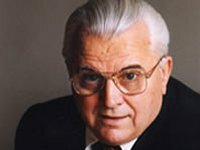 Ukraine's first president (1991-1994), Leonid Kravchuk, has said he believes that if Russia did not meddle with Ukraine's internal affairs, the country could have individually and quickly resolved its problems. "If Russia did not interfere in our affairs, with its direct messages aimed at the breakup of Ukraine, we would have resolved our problems very quickly, as we did in 1991, 1994 and so on," he said during the first all-Ukrainian national unity roundtable in Kyiv on Wednesday. "When close to our internal opponents there are direct enemies of the Ukrainian people, both inside and outside, they must be neutralized," Kravchuk said.